We learn from each other and from programs about the challenges, opportunities, joys, and frustrations of gardening in central Texas. Meeting goals: have fun and learn useful "nuggets of useful information". The 2017-2018 meetings will be on Tuesdays Sep 12, Oct 10, Nov 14, Dec 12, Jan 9, 2018, Feb 13, Mar 13, Apr 10, and May 13, 2017. Click here (2016-2017), here (2015-2016) and here for our 2014-15 program schedules. Some examples of prior meetings are shown here (2014-2015) here (2013-2014) and here (2012-2013). Our meetings is open to the public at no charge. Meetings start at 6:30 pm with snacks and socialization followed by club business and a program by "gardening gurus" until 8:00 pm. Plant and book sale, Silent Auction and Quilt raffle was be on Mar 29-30, 2019. This great event will support the Bastrop Library summer children's program. The Plant Sale, Silent Auction, and Quilt Raffle will support the Bastrop Library summer children's activity and reading program. This built upon the 2018 (and prior)event which had 203 programs and a large number of children in the Bastrop community. Click here for a slideshow of this summer program. This will be held in conjunction with the "Friends of the Library" annual book sale. We offer hard-to-find, Bastrop hardy perennials, shrubs, and succulents, along with vegetable starts. 100% of the proceeds will go to the Library’s summer reading program for kids. We raised over $11,000 in our 2018 event (even better than the over $8000 in 2017, $6,661 in 2016 and $5300 in 2015) at the event. Click here for more information. 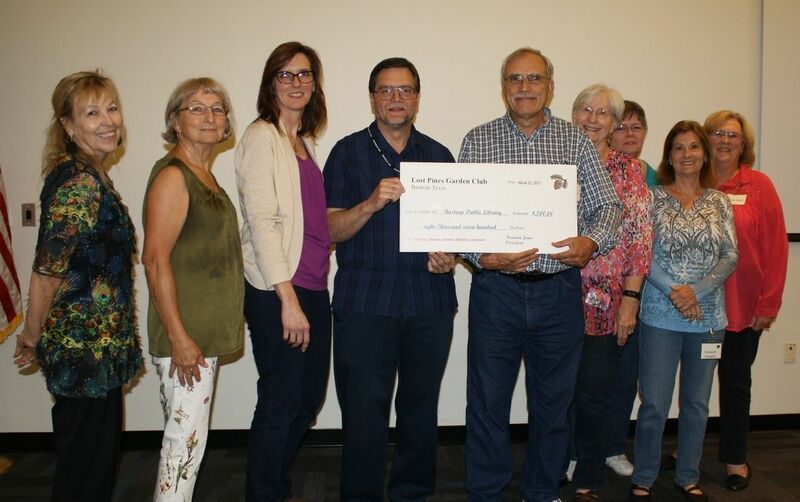 This is much appreciated by the Bastrop Library and the Friends of the Library to help support their programs. Program for May 9, 2017. The meeting program was "Keys to creating habitat from the back yards to the back forty". The speaker will be Jason May who is the Resource Specialist for Lost Pines Complex of Bastrop and Buesher state parks. Click here for his short biography. We will also install the new Club officers. Our club (with the support of Lowes) donated a lawn tractor to the Bastrop Family Crisis Center. This enables the Center to use in house resources to save on landscaping costs freeing up scarce funds to support their core mission of helping people in Bastrop County. 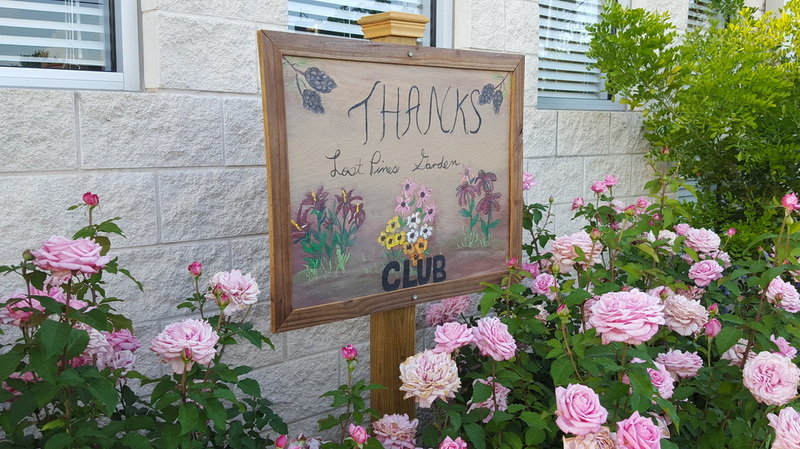 The Lost Pines Garden Club is an organization which promotes central Texas gardening through networking, presentations by experts, and facilitating access to information related to gardening. We meet the second Tuesday of the month (Sep through May) at the Bastop Public Library, 1100 Church Street, Bastrop TX. Monthly programs include a social/networking time, a short business meeting and normally an informative presentation or demonstration by a person knowledgeable in some aspect of gardening in our area. Membership is open to anyone interested in gardening. Annual dues are $15. Guests are welcome. We are members of the Bastrop Chamber of Commerce. Membership is open to anyone who is interested in gardening (flowers, vegetables, trees, shrubs, etc.). We also do projects which help beautify the community.